Ask your students if they have ever been on a team before. What does it mean to be on a team? What are some things they can do to help the team to succeed? The focus of this short discussion might be on the importance of support and sharing ideas/responsibility in teamwork. Standing in a circle holding hands, can your class pass the hula hoop all the way around the circle—without using their hands or letting go of their neighbor’s hands? How quickly can they do it? The whole group must stand in a circle holding hands, and they can never let go of their neighbors’ hands—if anyone lets go, the whole group must start over. No one may use their hands to grab hold of the hula hoop. The challenge is completed when the hula hoop returns to the same place it started, having passed all the way around the circle. 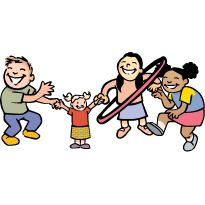 When your students are standing in a circle holding hands, separate two children’s hands, place the hula hoop between them and have them each reach through the hoop to hold hands again. This is the starting point. Tell them you’re going to time how long it takes for the hoop to get back to the starting point. On your signal, have them start passing the hoop all the way around the circle and back to where it started. Make sure you are timing them, and share with them how long it took. After their first try, ask them how hard it was to pass the hoop around without using their hands. How did they get their bodies through the hoop? Did it help the kids who went later to watch the first few kids pass the hoop? Did they get any ideas about how they should do it when it was their turn? Was it important to work together to get the hoop around each of them? Do they think they can beat their first time? Have the group try again and see if they can beat their best time. Try a few times until you feel they have a sense of accomplishment. As an extension, you could do this activity with two lines of children, racing to see who can pass the hoop down the line the fastest. For a slightly more laid back version, try the game Pulse from this curriculum (click here).